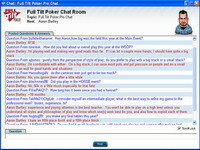 Full Tilt Poker is a relative newcomer to the online poker world. 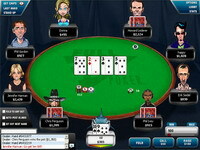 Fun graphics and great software make this poker site fun to play at. Endorsed by some of the biggest names in poker (Howard Lederer, Chris Ferguson, Phil Ivey, etc...), this online poker site has the makings for a real contender. 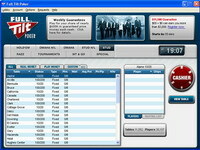 Software: Full Tilt Poker's software is very fun to play with. They use a very cartoonish approach, utilizing the use of avatars (cartoon characters) and different backgrounds. I found that this added some amusement to playing poker (it sort of felt like I was playing a video game). In general, the software ran quickly, but I found that there was some lag on occasion (probably due to the added graphics complexity). The software supports additional features including statistics, notes, total pot display (quickly determine how much has already been committed to the pot before you decide to act), auto center and others. Game Selection: Full Tilt Poker has numerous games including Holdem, Omaha, Omaha 8/better, Razz, Seven card stud, Seven card stud 8/better, Cap games and HORSE (these are ‘pentathalons’ that include Hold 'em, Omaha 8/Better, Razz, Seven Card Stud High, Eight/Better Seven Card Stud). There are no-limit and pot-limit games in Holdem and pot-limit in both Omaha variants. Player Traffic: Full Tilt Poker usually has in the neighborhood of 5,000 players online at any one time (tournament traffic of ~ 15,000 players at peak hours). 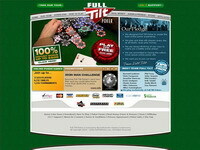 This places Full Tilt Poker’s site traffic in the mid to upper echelons of online poker sites. However, the majority of these players are playing in lower stakes games. Competition: The competition at Full Tilt Poker seems to be pretty stiff. As stated previously, most people are playing at lower limit tables, but don't let that fool you. There are some good players here. Typically, newer poker sites have the easiest players on board... this is not the case here. For some reason, this site has some pretty stiff competition. Bonuses and Promotions: Full Tilt Poker has numerous promotions including a 100% first-deposit bonus of up to $600, Refer-A-Friend bonus (Invite your friends to join and you can make $100 per sign-up), Ironman challenges, leaderboard cash prizes, Full Tilt points and more.